I picked up fabric spray paint from a craft shop. I'd never used this before, but it was relatively easy. The paint goes fast. In fact, this whole bottle got used up on the seat – and honestly, I could have used more. But I managed to squeeze out the last few drops and transform the seat fabric from boring beige to bold turquoise. Voila! Time for the fun part. 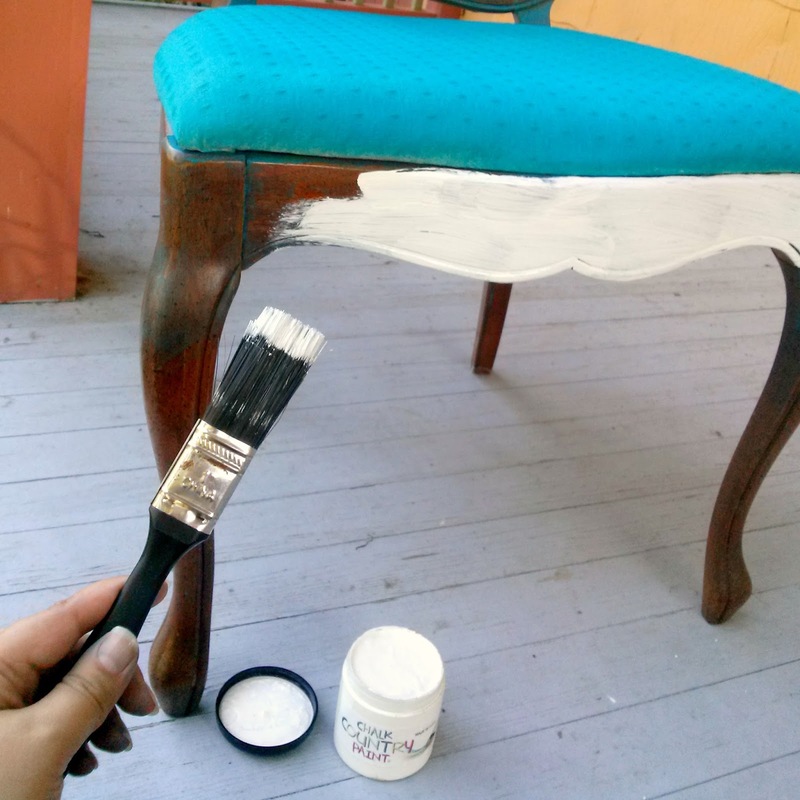 I've been so excited to try chalk paint. I've heard great things – like it doesn't require primer, that it dries quickly, and that it's really durable. So I didn't prime the chair. I just dove right in! I used Crisp Collar from Chalk Country Chalk Paint. It's the perfect white – nice and crisp with just a tinge of antiqued creaminess. Chalk Country is a family owned and operated company based out of Battle Creek, Michigan. They developed their chalk paint concoction back in the early 80's – way ahead of the trend we know and love today! And they've spent years perfecting their paint line and formula, as well as painting, distressing, and finishing techniques. There are a ton of colors available and they post helpful instructions online. So I believe that you're supposed to use a special brush for chalk painting. But I'd already made one trip across town to the craft store, and I was feeling cheap that weekend. So I dug out an old paint brush with stiff bristles. Another thing I love about Chalk Country Chalk Paints is that the paints are natural, non-toxic, safe, and eco-friendly. The products contain low to no V.O.C.s and are water-based for easy cleanup. The paint didn't give off any strong odors – I'm confident I could use this paint inside my apartment without putting myself or cats in danger. And since I sometimes tend to get more paint on me than my project, I appreciated that it washed off my arms/hands/face so easily. After an afternoon of painting, sweating, and beer-sipping, I was done! The paint dries amazingly fast between coats... especially considering the Iowa humidity that day. Don't be discouraged! As with many furniture painting projects, it looked worse before it started to look better. It will get pretty, I promise! The first coat lets a lot of wood shine through, but the second coat evened everything out perfectly. I purposefully went light in a few areas and left some crevices without paint for more of an antiqued look. The caning on the back of the chair was more of a challenge to get the brush bristles down into, so I gave that a third coat. You can probably see the light area on the seat cushion. I accidentally dropped my paint brush onto the seat. (I know, I know, I should have covered up. But I was lazy and risky.) The paint lightened the earlier afternoon's fabric spray paint, but I can put up with a little imperfection. Lesson learned. Besides, my pillow mostly covers the accident. I bought this little white tables years ago at an antique shop in my hometown. 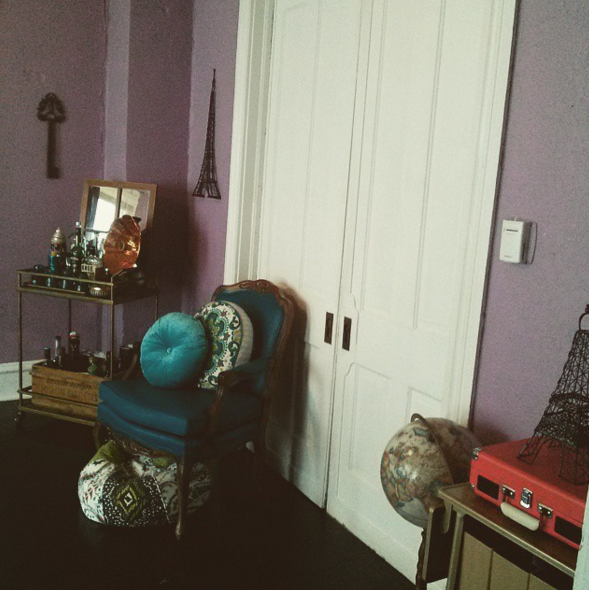 When I recently visited my parents, I found out that my sister had re-done her room and no longer needed it. So I piled it into my car and hauled it back to my apartment. 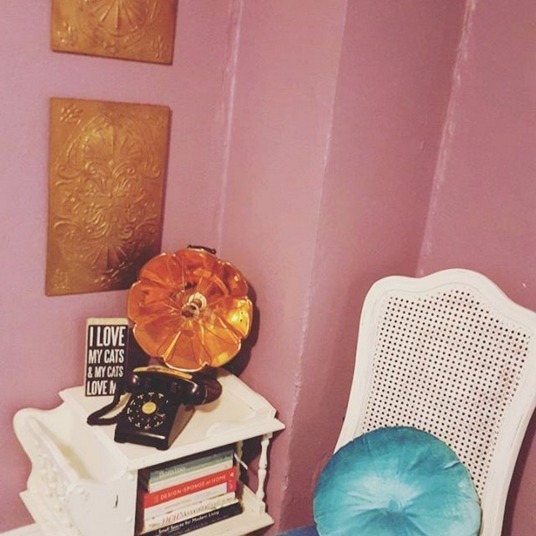 It's the perfect companion for my made-over chair – just the right amount of shabby chic to blend with my vintage phone, 1920's space heater, and copper wall decor. 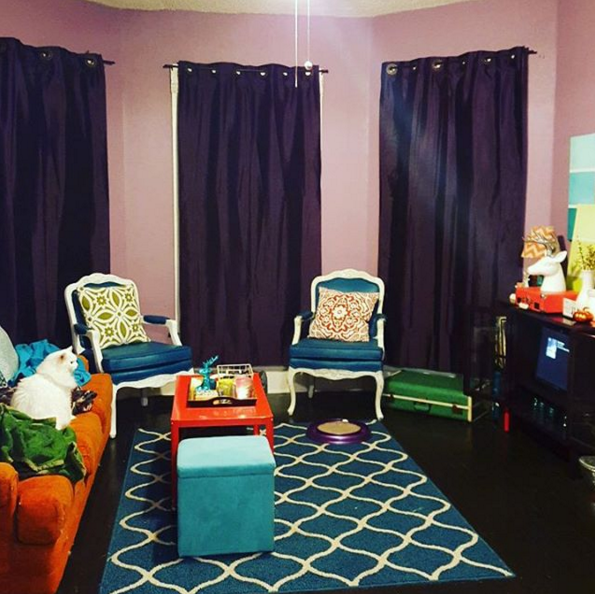 What an improvement for this corner since the chair and table came in! 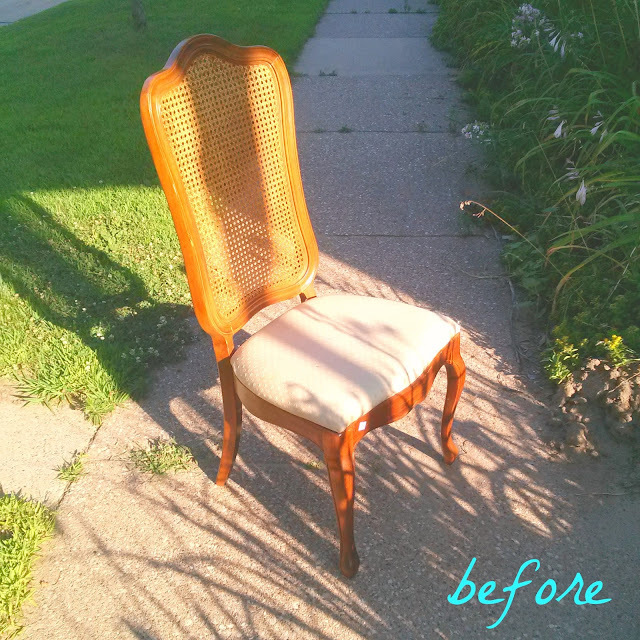 A long time ago, I painted the upholstery and spray painted the body of a vintage chair. 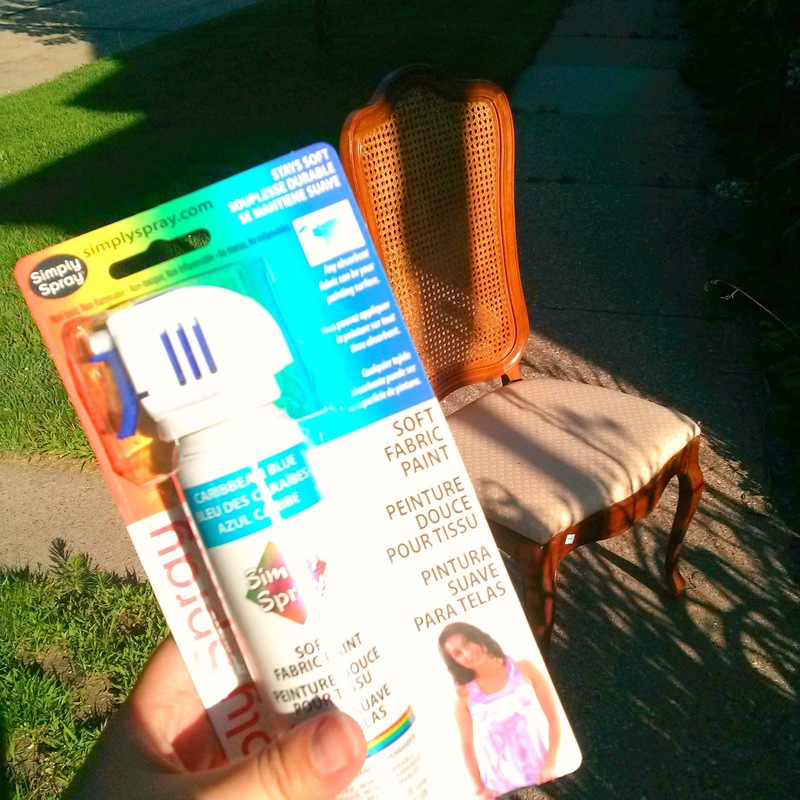 And since the spray paint process was such a paint, the chair's partner was sitting around with turquoise cushions and a still brown frame – basically driving me crazy. 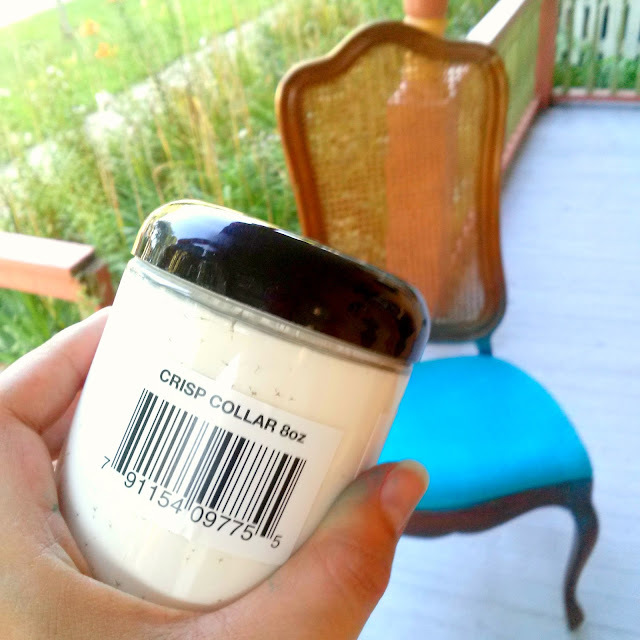 I still had about half the container of Crisp Collar Chalk Country chalk paint left, so I put it to use on my other chair. Now, they mostly match! The first chair I did (years ago) was spray painted, so the finish is kind of glossy. 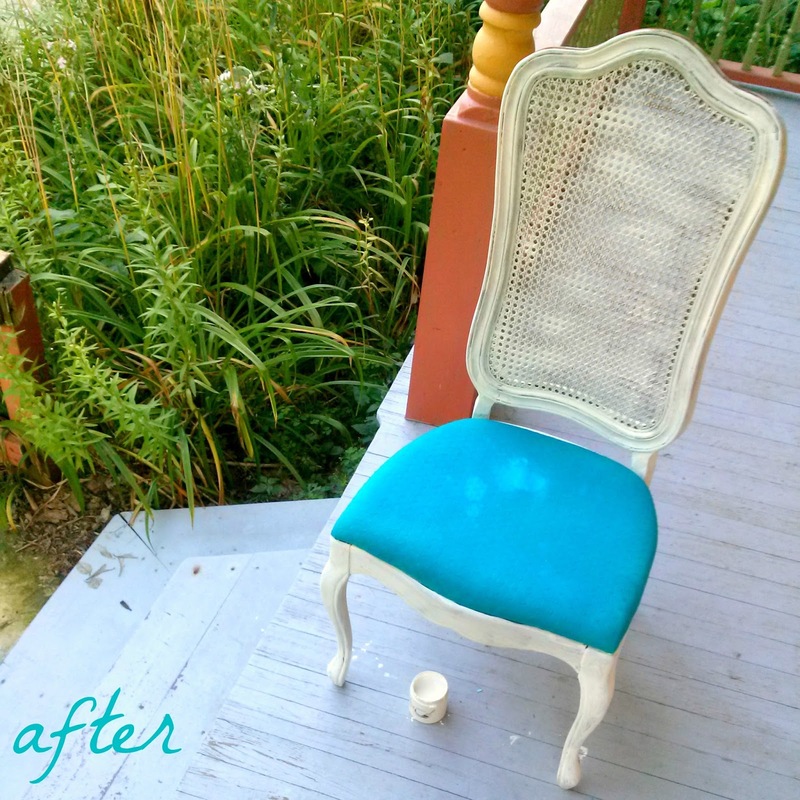 The chalk-painted chair is matte finish and a bit brighter. Since I still have more of this chalk paint in the container, I'm going to go over the spray painted chair with it so that they both can have that nice, bright, matte white finish. It's amazing how far a little container of chalk paint will go. By the time my little 8-oz. sample container is used up, it will have covered three chairs. I still have another 8-oz. container of Crisp Collar and yet another color-to-be-revealed. This project focused on something vintagey and shabby chic, but I've got another chalk paint project coming up that's a bit more sleek and modern, so stay tuned! 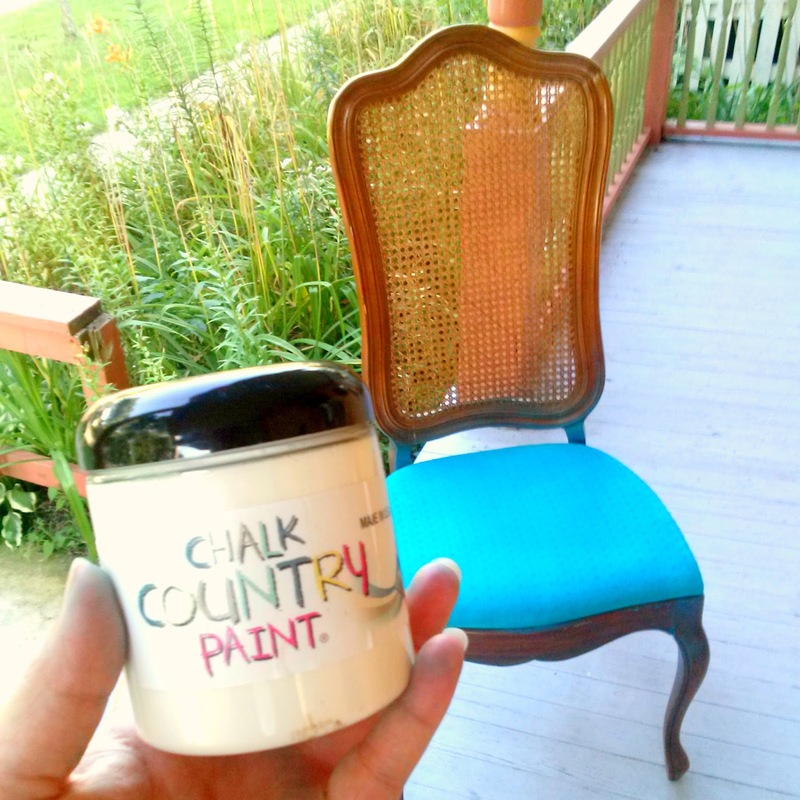 Go ahead – check out the Chalk Country website for chalk paint colors, instructions, and project ideas! 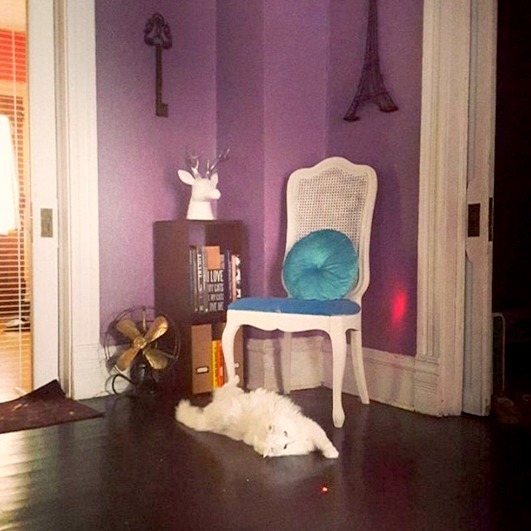 Your pictures at the end look like they were taken in the 1960's or something... so if that was what you were going for (since you have all that vintage decor), you nailed it! Haha.